Where do Air Force planes go when they die? To a scrap-metal cemetery in Arizona. But before they fade away completely, some of them decide they need some new ink. Near the Air Force’s so-called “Boneyard,” a stockade of retired planes on a base outside Tucson, is the Pima Air & Space Museum. It recently hosted an exhibit called Art from The Boneyard, in which artists got to use Flying Fortresses, B-24 Liberators and other World War II-era aircraft as their canvases. But don’t go expecting gauzy, patriotic imagery. 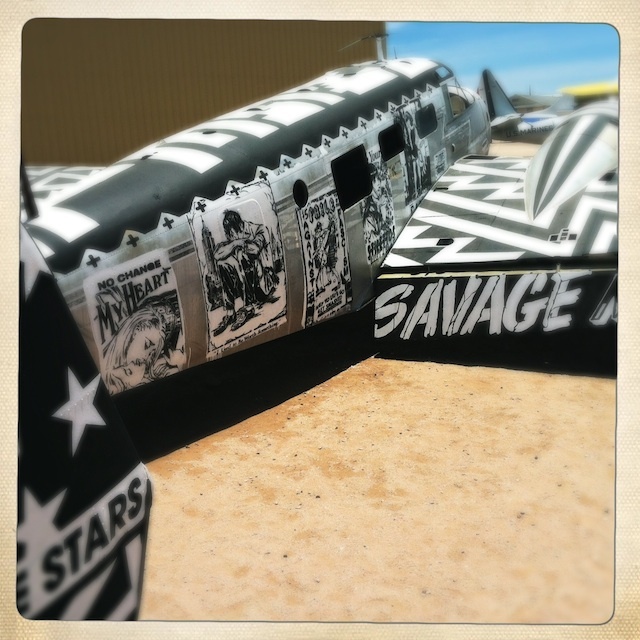 These old planes look like they just came out of a Tijuana tattoo parlor. Usually it’s people getting tats of planes. Not this time. And wow, do these photos accentuate the seediness of the artwork. A friend took them, ran them through his Instagram filters, and posted them to his account. He asked to be identified only by his Twitter handle, @meekwire. “A great collision of three things I’m interested in: art, aviation and military history,” he says. Here are some of our favorite @meekwire photos from the Boneyard exhibit. There may be more canvases to come: The Air Force is set to retire hundreds of planes under a new budget plan, including all of the C-27J transport planes that trafficked cargo in Iraq and Afghanistan. Take a shot of whiskey if you need it, but getting inked is less painful than a bee sting, and you’re a war veteran.